The following excerpt is by Connie Larkman of the United Church of Christ. There is no time like the present to get ready for Mission 4/1 Earth! “Mission 4/1 Earth will be the United Church of Christ’s next incredible shared witness to the world,” said the Rev. J. Bennett Guess, executive minister for Local Church Ministries. 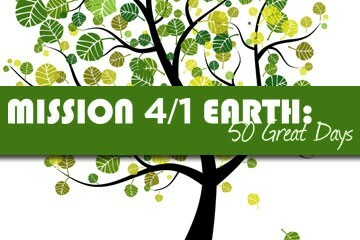 And even though there are almost six months before this all-church initiative –– Mission 4/1 Earth: 50 Great Days, kicks off April 1, 2013 –– the UCC is rolling out the resources now to assist in the planning process. The place to start, the Mission 4/1 Earth website, outlines the initiative, offers suggestions for ways to get involved, gives participants an opportunity to share their ideas, and includes answers to frequently asked questions about the project. There is also a complete campaign manual available for download. Mission 4/1 Earth invites us to green up, power down, and shout out for the environment. Beginning on Easter Monday 2013 (April 1), the UCC lifts up 50 Great Days of Mission 4/1 Earth, in hopes of reaching more than 1 million hours of engaged earth care, 100,000 tree plantings across the globe, and 100,000 advocacy letters written and sent on environmental concerns. Click here to read the entire article.